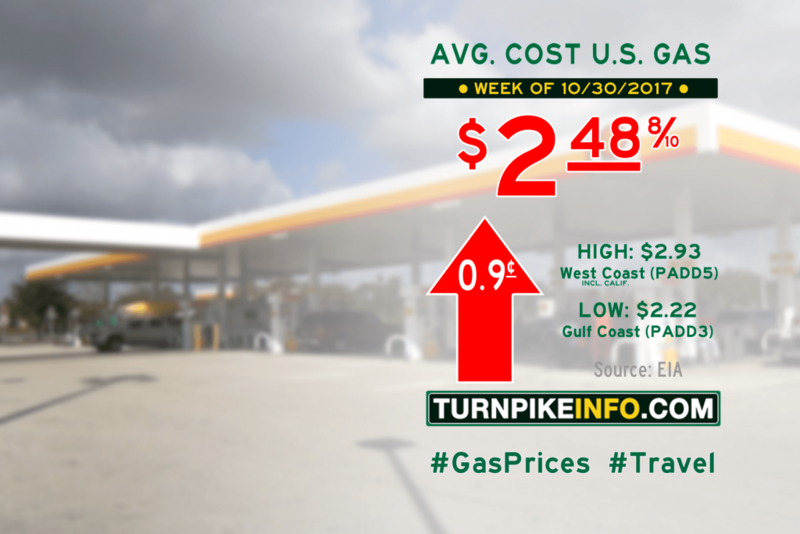 Fort Lauderdale, FL – The national average price of gas trickled back up during the past week, according to the U.S. Energy Information Administration. The weekly E.I.A. fuel price survey shows the average cost of a gallon of regular unleaded trickled up about a penny to about $2.49. Even so, the cost of fuel in some regions declined by about a penny to a penny and a half per gallon. In fact, prices in the nation’s most expensive markets actually remained the same, with the West Coast average ticking up an barely noticeable 0.3¢, on average. Meanwhile, along the Gulf Coast, where prices are the cheapest, the averages dipped by over a penny per gallon. In what could be a portent for regular fuels, however, the cost of diesel jumped over two cents per gallon during the past week, according to the E.I.A. The average cost of a gallon of diesel is now $2.82, up from about $2.80 last week. Fuel prices for all regions are shown below, as gathered from www.eia.gov.